Toronto, April 10: Incumbent Israeli Prime Minister Benjamin Netanyahu and his opponent Benny Gantz have both claimed victory in the general elections after results from three exit polls were released. 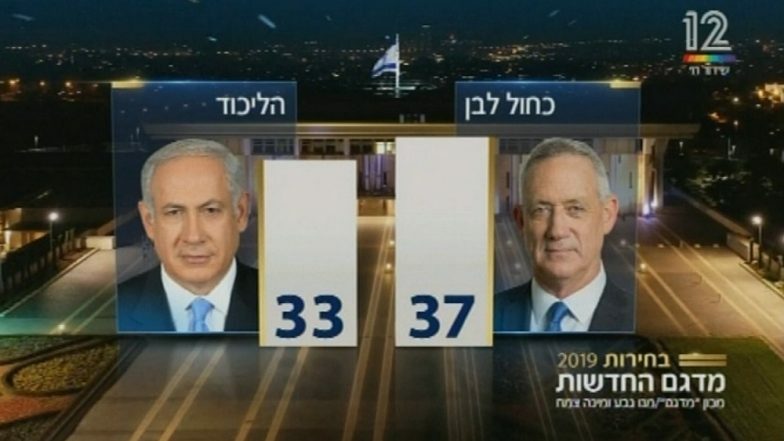 Two out of three exit polls announced by Israeli TV channels showed Gantz's party taking more seats of about 36-37 in the Israeli Knesset, while a third poll showed Gantz’ and Netanyahu’s Likud parties reaching a tie. Official results of Israel's elections are expected to be announced sometime on Wednesday. But two of the polls also said that Netanyahu was in a stronger position to form a coalition government with the help of other right-wing parties. Soon after the polls closed and as the exit polls were being announced, Gantz’ party announced its victory, "We won! The Israeli public has had its say!" But Netanyahu too claimed victory and said, "The rightist bloc led by Likud has won a clear victory," Netanyahu said in a statement, "I will begin forming a right-wing government with our natural partner this very night." Both leaders would require to form alliances to reach the 61 mark in the 120 member Knesset.